I have come across many posts, here, on LinkedIn and on various other webpages, discussing Piping Experience Vs 3D Cad abilities ... so I wrote an article about it. Please use this forum to air your views on the subject. A RF flange lets you pull the valve or flange away from the other face easily and quickly, and the size of the standard gasket lets you hold the gasket in place with the lower (loosened) bolts across the bottom of the flange as the gasket slips back in place from above. So the gasket isn't too likely to get misaligned and block flow or leak. My recommendation? Whenever you can, use the simpler installation. The more complex gasket & face (grooved face or single use gaskets) are more likely get screwed up by the field up on a scaffolding or in a manlift. What's more likely? A twisted, deformed or scarred gasket getting "reused" because nobody will know? Or the guy who screwed up going back down to grade level, walking back to the warehouse, filling out the forms again (accepting blame for the wasted first gasket!) walking back to the site, back in the man-lift, and back to the face of the flange? Which proves that without training from the 'old hands' the next generation will struggle to get to the same level and beyond. Very good observation, and an interesting one, its a chicken and egg thing, i think as an operator one has a chance to apply knowledge, but there is a missing link, process, piping and mechanical design roles can get very muddled in newer projects, even project management is giving design input in places. In my experience as a designer, getting scope to apply knowledge becomes very crowded, often yielding questionable results. EXACTLY!!! It seems employers want cad jockeys instead of designers. It doesn't matter how much you know, it has everything to do with software. Heck, I can LEARN any software...but really...how many different types of software are you going to be able to learn if you're with one company for more than a year or two? TRUE STORY ANTON! As an EPC company it's very important to find desigers proficient in the software relative to each project. The project is underway and there's no time for software training. 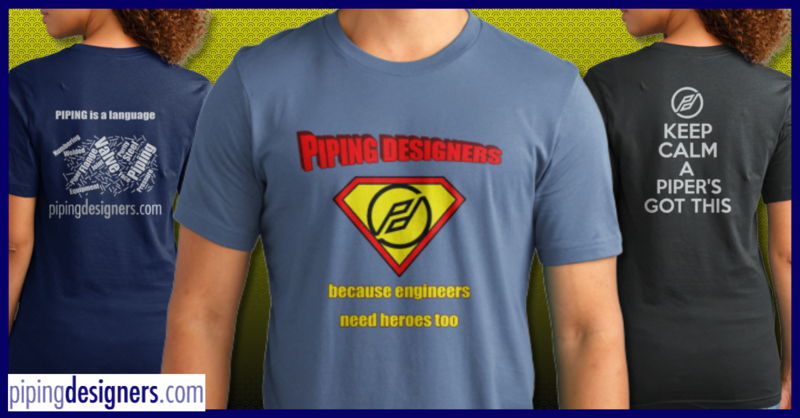 For example, right now we are hiring piping designers with heavy PDMS & EPC experience. (Houston, TX) Equally as important is good tenure. Must be eligible to work in the US without sponsorship. That is so true. I believe it is partially driven by Human Resources and or the recruiting staff. The software is typically the first on the list of pre-requisits for a job opportunity. A good experienced designer can pick-up pretty quickly any design software that is out there. While a CAD operator who knows all the tips tricks of a given software, may not be so savy with the lateral thinking that makes up a good designer. Your statement, software vs practical experience is very true. Based on my previous experience and hnadling mostly all critical and few world's largest projects in 3D platform I wouldlike to summarize the issue as below. 1. Modelers shall possess design concepts . Nice theory. You missed the point. Don't forget the tendency of the big shopsCompanies to offer training in PDS + PDMS to the younger pups with little or no practical experience than those of us with a few gray hairs but years of experience in AutoPlant and CADWorx, in addition to extensive field experience. Gents, nothing compares to site/construction experience especially for revamp projects and turnarounds. Everyone may learn any software whenever, but if you want to know piping and good designs, you MUST be involved in the dirty job! Totally agree. Brownfield construction is where true experience is acquired. Especially when you are held accountable for your own work. Now, how do we get human resources and the recruiting agencies to put that at the top of the list of pre-requisits and software at the bottom of the list. I don't mean to rant, but as far as Design goes (not only Piping but for all disciplines) I'm seeing alot more garbage today then I would have seen 15-20 years ago. Its not grey hair or knowledge of software its real practical experience and exposure which makes the differnece.But definitely the knowledge of software can imrove the project pace. I have seen many design engineers who are conceptually clear deliver a good final end product since they've seen what they've designed. I also have seen people with 35 years of experience arguing wrongly with good software knowledge since they've not got that exposure. So its the duty of the Organisation to provide the nature of exposure at right stages and need basis. Also Iam not agreeing to the point only construction exposure will help this. But after primary conceptual training......people shall be posted on a live project with experienced conceptually right people to an extent and they shall be exposed to site and site querries subsequently to make them undersand their design flaws / improvement.But a project cannot afford too many flaws hence a training programme shall be developed if the Organisation shall sustain in long term.Also there need not be two departments like the old days concept when softwares were a privelege of few when design sketches were made or 2D drawings were generated and then converted to 3D design. All the deliverables and activities shall be done in direct 3D concept (full implementation - this is where u require a conceptually clear designers and experienced people who can sit along with them and guide them during periodical or daily review sessions). Revamp is a differnet ball game when these concepts dont work. It shall have close coordination with construction like sequencing, constructability, accessability , Oprational Feasibilty, Shut down, partial shutdown, hot tap etc....That concepts can be developed only with real exposure to the particular type of jobs. To Conclude the following shall be taken care in interview. Grey haired 2D designers are demonstrably almost twice as fast producing piping deliverables as is done in 3D. Currently people allow 30 to 60 manhours per line number and 8 hours per iso. Both with a 3D model. In times past you were never allowed more than 24 hours per line number. And iso's were created from scratch in 6-8 hours. Not built in a model, extracted, and still needing 8 hours to complete, but 8 hours from start to finish in 2D cad, with BOM, stress, supports, etc. All from 2D piping drawings. I am not disrespecting or disputing your content but the matter of fact is project execution philosophies had changed over years. It was freezing of design and then proceeding with execution earlier but now we need to start parallel @ 30% stage of engineering; so for being competitive in market you need to be dynamic and visualize the changes. Hence having executed both I feel 3D is the good option for Visualization of impacts. And also if things are finalized even in 3D it is executable with 22 hours and I've achieved even at 18 hours. Marketability is the name of the game. 3d cad has been around for decades. PDS, PDMS, AutoPlant, CadWorx, are all aging; all of them really feel old. I actually think that a revolutionary design tool eventually be released and will catch them asleep at the wheel. The youngest on the street is AutoCad Plant 3d; it must nearly be 5 by now. Why are there pipers who know many of these 3d software tools? Why are some who don't? If you don't have many years of experience in many of these tools, why not?How did admins become administrators? We really do lead the professional lives of our choosing. We didn't accidently 'just' become pipers, did we?Some of us are lucky, others make their opportunities. That's a great article. However, one point that is missed is that the term "3D CAD operator" is a misnomer. In my experience going back some 27 years in this industry, is that 95% of CAD operators are only 2D operators. The new tools can make them work in 3D, but if they cannot think in 3D then the tool is just wasted. The understanding and ability to visualize beforehand and to think spatially in the 3rd dimension is beyond the realm of most people. The fact that the term "CAD operator" is used implies that the person has no formal training in the engineering arts/piping trades/drafting and has only taken a basic CAD course. Now the better terms should be CAD drafter/CAD designer/CAD detailer based on experience. It's true that most good 3D CAD piping designers started out with paper/drafting table work then progressed to 2D CAD and now finally to 3D CAD. Most youngsters today just look at the 3D aspects of the tool without paying attention to detail and thinking ability required. The companies just don't care because they get a young person cheap who knows all of the commands, but nothing else. It took me 12 years of experience before I started spooling because I learned all of the tricks of the trade from senior steamfitting and pipefitting foremen by breaking down my mechanical room layouts and taking their rough spool sketches and cadding them up into iso's over a 6 year period on several large projects. This is how experience is gained - low pay at first for several years and if you've got what it takes, then the pay steadily increases . I know that this is a generalization based on my experience, but senior pipers do have a significant role in our industry as "layout men" even if they don't know the latest, most sophisticated 3D software. Based on their experience, they can guide projects and youngsters by providing recommended 2D layouts, concept sketches, equipment layouts, etc. - i.e. the role of the "master planner" and pass these on to the guys who know how to use the software but are lacking in real layout experience. Last week, I ran across the T-Square that I used in college and on a few at-home projects. I threw away my slide rules. I've given away my templates and other tools to my engineering son. At times, I want to borrow them back but I have to admit, I'm never going to fire them again in anger. Except for some legacy drawing maintenance, field sketching, and paper studies, we've moved to all electronic documentation. It's over. It's settled. It just too cheap to buy the HW and SW and too superior a document to print and save (as PDF). I think the same bar-raising is happening from Computer-Aided Drafting to 3D modeling. There are just too many design checks, ways to re-purpose the data, ways to integrate and automate. So maybe this change is a done deal as well. If I can spend $50,000 for a UPS delivery truck for each driver, I can spend $20,000 for a CADWorx seat for each designer (I'm guessing on the price). It's just another cost of business and my customer expects it. Deniz and William I agree with you guys totally. I have 30yrs experience on the board with 16yrs on site, including supervising but with my limited 3D experience, I am not selected due to lack of 3D experience with at least 5 packages. I have all of my old board drafting equipment and I am still using my Oak Mayline table almost daily; with that said, a few years ago I took it apart and built a set of short legs for it, it makes a great computer table. I have been drafting for dollars for 32 years and drawing for a few longer than that and I can model with the best of the youngsters; however, I tend to think of myself as more of an exception to the rule than the rule. I tend to agree with most of the commenters here and think it is criminal what many of the colleges and most of the "Tech schools" are putting out. The critical question is "what date representation best serves the client?" Designers don't make drawings, they make and assure data. Sometimes that data lives on paper drawings, sometimes in 3D models. It depends on what is cost-effective for the client. For small jobs, with little automated rule checking or data repurposing, paper is fine. Designers need to know how to "render" data using a T-square and orthogonal views. But the cost of CAD is become so low and the skills so widespread, most jobs, big and small, can be done in CAD. I would like to agree. I started on the drawing board and it makes you think differently about how you present the information and also the accuracy of what you are doing. I see too many people these days accepting what the computer tells them. You can do a "rough sketch" on the computer (A quick outline with estimated information) That can often be read by others as "perfect" because it's on the computer. When I switched to CAD I found it hard to think in 3D but once I managed the switch I wouldn't go back, but despite the switch I still like to think out the best way to produce a job, ie is it quicker for a hand sketch. Often it will take longer to do it on CAD. 3D modelling is definitely the way to go for most jobs. The model gives you far more information than just a paper drawing, it can produce 2D renditions and also a 3D model that can be viewed by the client, contractors etc. This CAD model if managed correctly can be carried on through to future projects. The other benifit of working with modelling is when working with other offices either in the same country or workshare with other offices, the ability to transfere the data and work cooperatively is far easier with CAD. In New Zealand we have small pool of staff and when large projects come in it is hard to find enough staff for the project so we often work with othe offices around the world. I came from the field after almost 20 years of pipe install to now drawing in 3D. From my experience in the old 2d days lines were put on paper and the trades in the field were left to getting it installed in the building space. I know they were doing light table coordination but a lot of things were missed to be worked out in the field. These days with 3d BIM most of the field issues are taken out before going out for install. I think it helps me with having experience being out in the field to now drawing. I do not have a lot of formal cad training. I have mostly worked in 3d and BIM, also a few jobs were 2d light table. I am not sure what category that puts me in. In my mind i have more knowledge in the practical installation part of the job than 99% of the engineers i worked with. I do not have the technical knowledge that they poses as far as sizing and system functions. i also think owners only see BIM as a added cost and most don't see the benefit of less field issues. I would love to see to side by side projects going that are the same. they could do one in BIM and the other 2d light table, then total everything up at the end. Craig raises an interesting point, Everything the designer creates is a message to someone in procurement, fabrication, construction, operations or maintenance. While the basics of orthographic projection are part of the language of the message, the designer has to anticipate their needs. That's why the designer body of knowledge is much, much more that a "drafter" or CAD Operator BOK. (I mean drafter in a respectful but narrow definition.) The designer "begins with the end in mind" as Covey would say. The checker rarely has to say, "that's not drawn right." More often, he says, "that won't work" or "we can't build it" or "the operator will give you a new name" or worse. These are all downstream or end user considerations. Reading through the comments above I have seen many points that I personally can relate to. So I hope that my opinion can bring a little something to the table. From what I can tell is that yes many designers are being overlooked because there is not as much of a need for multiple, experienced designers due to software. What I mean by this is many companies are taking the one designer and flooding him with cad operators with speed and ability to produce drawings due to developments in software. There is less of a need because you don't have to pay as much attention to the small print so to speak because the software does this for you. The need for thoughtful designers is now limited to a few. And while this stands to be somewhat beneficiary for the bottom line the real problem is what happens when the batteries in your calculator die and you have to break out a pencil and paper to find the hypotenuse of a triangle? The desire of the first company I worked for was to eliminate the time and extra manpower necessary for the Designer/Draftsman arrangement. In other words, the designer creates the design using a CAD tool; no handing sketches to a draftsman. When I taught CAD systems at that company, the students who were long time designers had a hard time accepting CAD as a tool, basically a replacement for the tee squares, mechanical pencils, and drafting boards...and that CAD was not going to replace THEM. New hires, with no design experience also were required to use CAD, but, like everyone else, they had to start with 2D flow sheets and simple stuff. I would beg those resistant to CAD, or who thought they could avoid the C-word until retirement, to learn some of it, and to devote a few minutes a day to playing with a new command. Some, who did not follow my advice, were excluded from jobs where CAD experience would have opened the door for them. Most important thing to understand is that from system to system, 80 to 90% of the functionality is the same, but the implementation and command names are changed to avoid law suits. So what I'm saying is, if you learn one system well, it's only a matter of finding the same command on the unfamiliar system. You can always draw parallels between the systems. Since most people use 20% of the commands 80% of the time (the 20-80 rule), that's less to learn, so you should be up to speed as fast as your motivation carries you. CAD was never like the old joke about the wife who told her husband he could make all the "Big" decisions and she'd make all the little ones, then the husband found out there weren't any big decisions to make anymore. It's more losing a dollar on every item made and trying to make it up in volume. An inexperienced, ignorant CAD operator, no matter how fast, can do some serious damage to a project before he is found out. That damage might go undetected because "computer drawings" look right and are automated. It's compounded by checkers having to look at data in digital form and often, un-rendered in formats they are accustomed to. The offsets to that work process downside is that there are automated design rule checks that trap errors at the designer's desk, hopefully before a busy checker has to see them. In addition, the color coded and photo-realistic renderings make understanding by none-drafting-literate domain experts much easier. Construction trades, subcontractors, operations and maintenance now have a seat and the design review and can head off trouble a lot earlier. I've seen it done. So, I still see value in raising the skill level of CAD Operators BEFORE they can make consequential design decisions. It's probably better and cheaper to make a good designer into a CAD guy than the other way around. 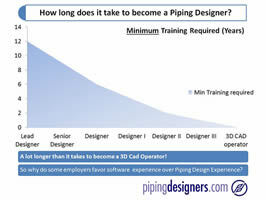 In fact, it's still hard for new 2 year AAS CAD graduates to break into piping design. They need a couple of years of experience and companies do not want the training headache. Paraphrasing Churchill, " The <employer> invariably does the right thing, after having exhausted every other alternative." Employers will train newbies only after it becomes clear they cannot recruit and retain staff trained elsewhere (to their own high standards, no less). Newbies just have to hope that the old guys retire faster than the increases in software and other design productivity.